I knew long before I got engaged, who my bridesmaids were going to be. When Anthony popped the question, I waisted no time preparing to ask them. I knew I wanted to ask them in a way they would never forget; that meant something to both of us. 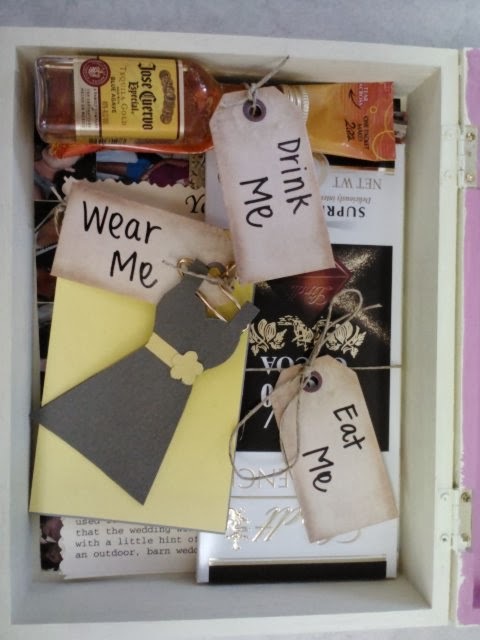 I made each bridesmaid a treasure box with an 'Alice in Wonderland' theme. All of the boxes were the same except one, but we will get to that later. The first thing I did was paint the cigar box. I used a cream outside and a bubble gum pink inside. 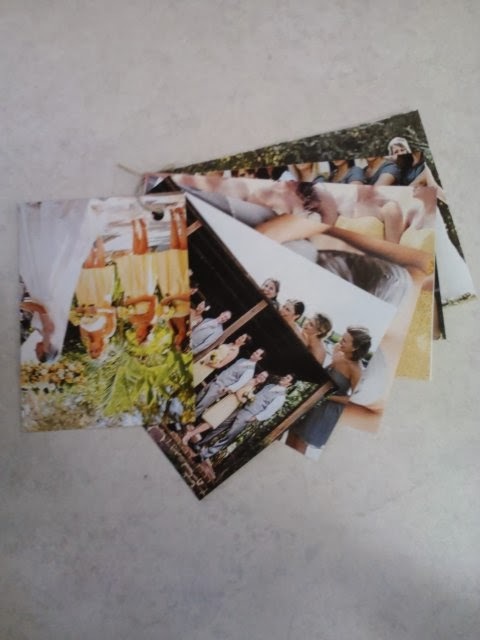 While I let the box dry, I gathered all of the pictures I had of me and each of my bridesmaids individually. 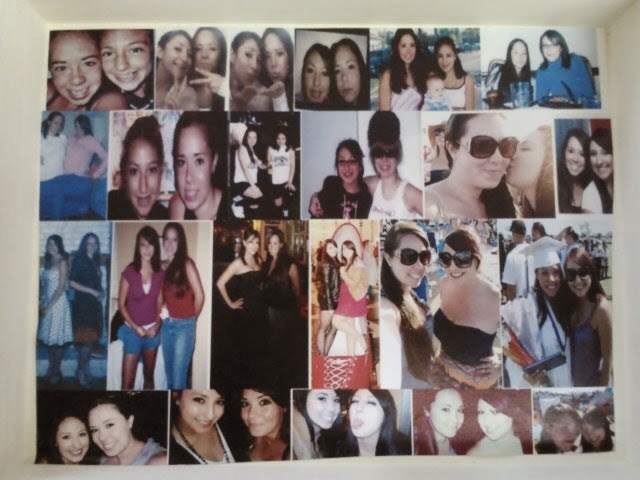 I put them together on a photo collage and printed them on a sheet of paper, the size of the bottom of the box. 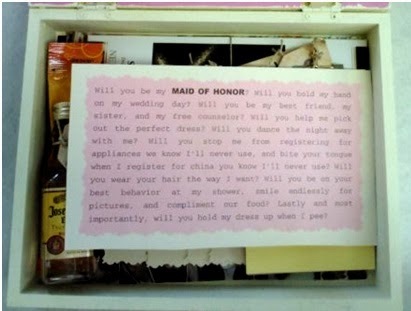 The example I am using is the box I made for my Maid of Honor. Kaitlyn and I have been best friends since we were 9 years old. I had to do a lot of digging for the photos from when we were younger. I scanned the hard copied onto my computer and created a word document. While on the computer, I started making my 4 piece letter to go inside. 1. 'Our Day' - Here, I wrote the the date of the wedding, the venue location and the theme of the wedding. they weren't required to to anything for me, but be there for emotional and moral support. listed their name and title, along with something sweet about them. 4. 'Your Dress' - Everyone dreads a bridesmaids dress, but here, I let them know that they are allowed whatever style dress they choose as long as it is the same color, fabric (not satin or silk) and knee length. When I was done, I printed them on the card stock I bought and cut them with shaped scissors. 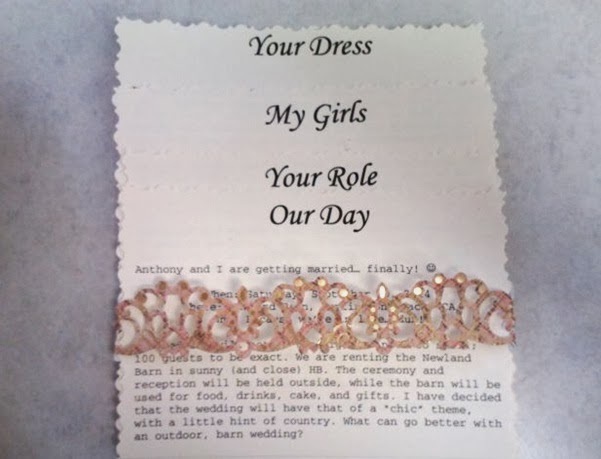 I did the same with a cute little note asking them to be my bridesmaid. 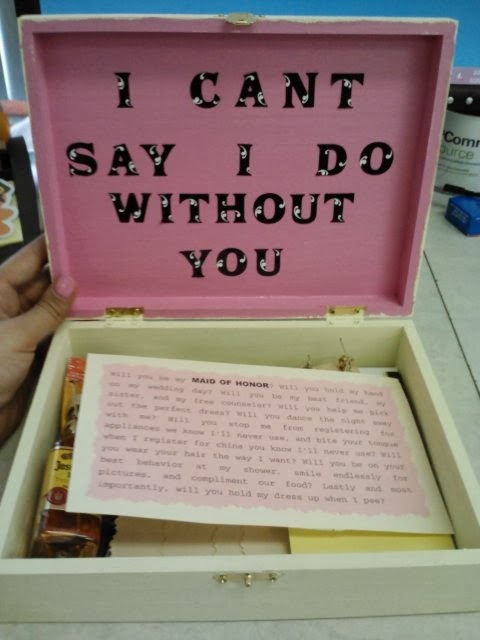 After I made the photo collage and letters, I put together all of the little items that go inside the box and their tags. 'Eat Me' was a large bar of chocolate (What girl doesn't like chocolate?). 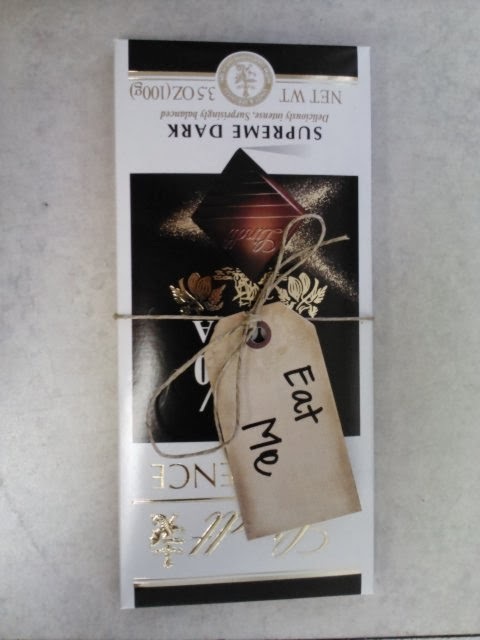 I labeled the tag and tied it around the chocolate bar with the twine. 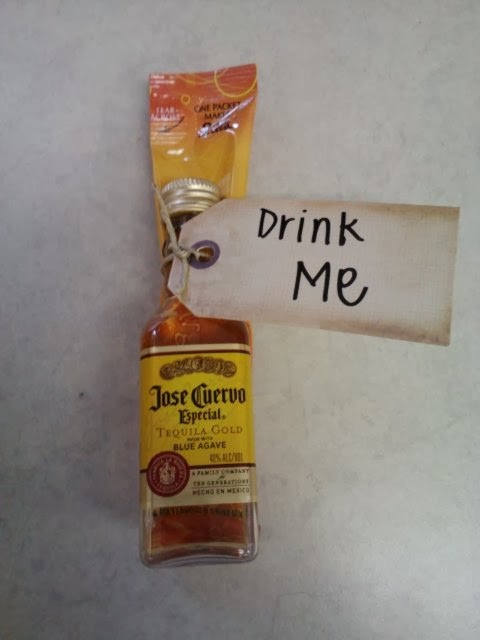 'Drink Me' was a little bottle of alcohol with a flavored Crystal Light packet. Kaitlyn's happened to be tequila with a margarita flavored packet. 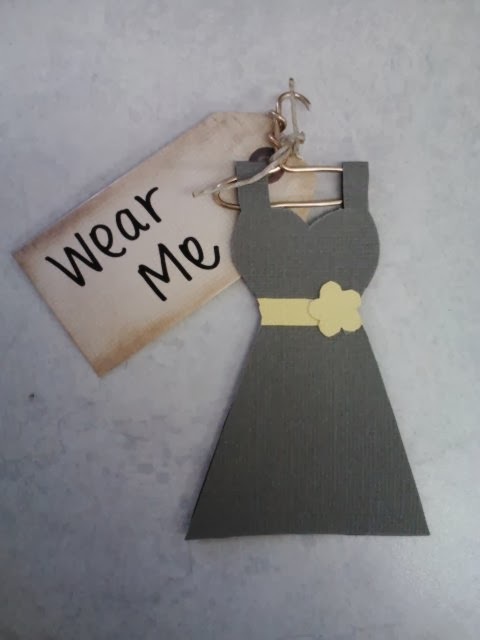 'Wear Me' was a dress I made with card stock. I used the colors of my wedding, gray and yellow, to make the dress. As for the hanger, I used jewelry wire to molded it into a little mini hanger. 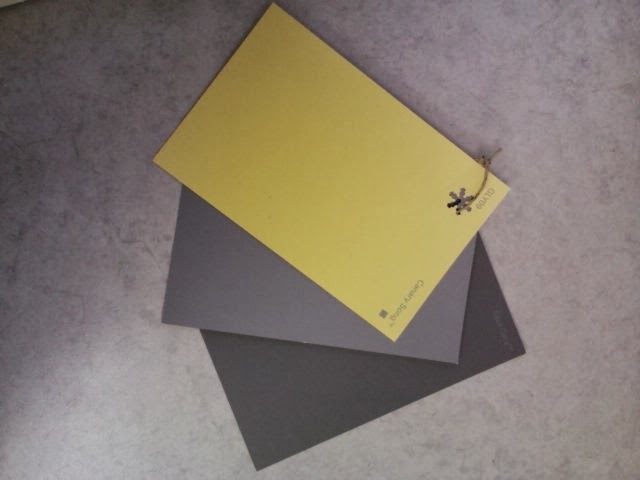 Two other items in the box were a scheme of Home Depot paint cards to show them my wedding colors and about 5 pictures I found on Google images of different style bridesmaids dresses and colors. I hole punched them with a shaped hole punch and tied them together with twine. 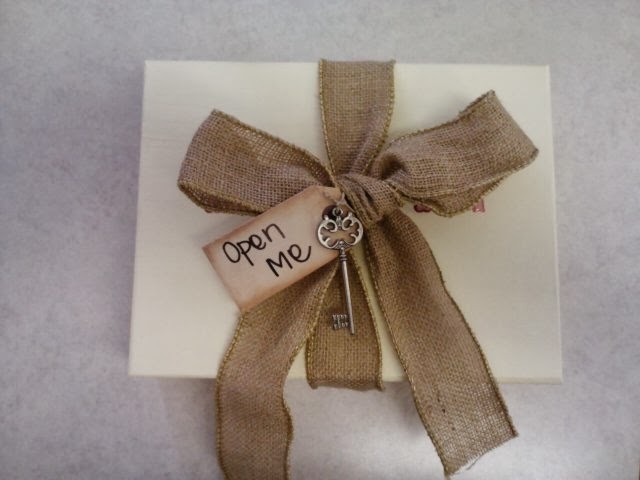 When the stickers were in place, I closed up the box and tied a burlap bow around it and added the skeleton key with twine around the bow, along with a tag that said 'Open Me'... and it was ready to give. en before hand. All of them accepted and all of them cried tears of joy! All I have to say is when you ask your bridesmaids, make it personal; make it meaningful and do something that will make them feel special during a time that is all about you. Here are some pictures from two of the bridesmaids.